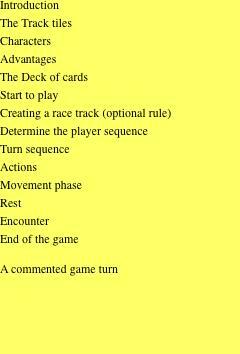 Each player's turn consists of actions (optional) and phases (mandatory). The phases must be performed in sequence as follows. The actions can be performed, if the player wants, at any time they are allowed. 1. Preparation Phase. The player draws a card from the deck. The player may not take action before this stage. 2. Movement Phase. The player must play a card to move. The number on the card that was used to move is the only thing that is considered. All other aspects are ignored. The number indicates how many Movement Points can be used to move the character. Playing this card is required unless you decide to Rest. 3. Encounter Phase. At the end of the movement, the character that has moved will have an encounter, drawing a card from the deck and reacting according to the card he/she has drawn. 4. Replenishment Phase. The player replenishes the cards in his/her hand, up to a maximum of 4. If he/she has more, the player discards the excess cards by choosing the ones he/she prefers. If the player has less than 4 cards, he/she draws from the deck as many as are needed in order to have 4. Finally, if the player has Artefacts that are being activated, now they are ready to be used. Once replenishment is complete, no actions can be performed.